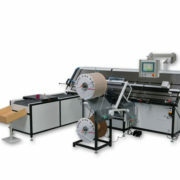 For RENZ RING WIRE® binding from the endless spool, for block-, calendar and skip binding. The prepunched binding material is manually placed onto the feeding station, automatically transported to the binding station and closed. 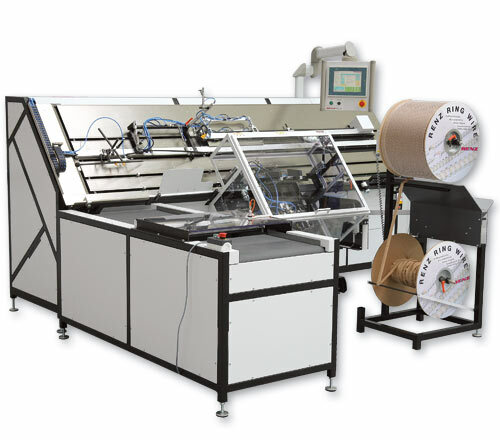 Fully automatic system for calendar hangers, KAS 300 IL. The Renz concept is the only system in the world to use straight wire pieces which are formed into the hanger shape and then guided into the binding. 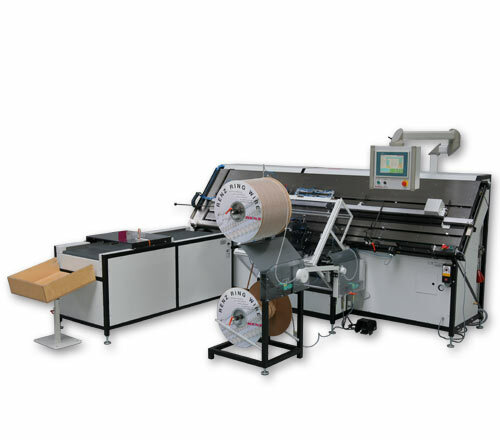 Fully automatic spool dewinding with winding of separation paper strip. For the trouble-free dewinding of all diameters. The winding of the paper separation helps reduce waste in the work area. – Connection with assembly machine (for significant quantities). – KL 500 cross-delivery: with possibility to select height and displacement of pile. – Transfer station to a packing machine (for significant quantities). Optionally available for this machine is a spare parts package. If you buy it with the machine it ensures high availability for critical spare parts as well as for spare parts with long delivery time. If necessary the required spare parts are immediately available on-site. With the help of a spare parts package downtimes can be reduced to a minimum. Compressed air: 7,5 bar 450 – 500 l/min.